All recorded music supplied conforms with PRS licensing requirements. Provide us with the details of what you need the music for and we can prepare appropriate pre-recorded music to meet your requirements that comes covered by the correct licences for its preparation, distribution and/or intended use. We can prepare pre-mixes for anything from running tapes for athletes to backing music for private fashion shows or events. We also prepare backing music for retail stores, commercial environments and can arrange for the appropriate licences for your scenario. Music can be supplied via secure download link or on hard formats such as memory sticks, CDs, DVDs, mini-disk. Send us a play list and we will professionally mix the music into one continuous mix for you. Could be a list of your favourite tunes, the songs played at your wedding or on a special occasion or even a traditional mix set to play in your car or whilst working out. Music can be supplied via secure download link or on hard formats such as memory sticks, CDs, DVDs, mini-disk, cassette tape and even 8-track (although I will need to add some time to clean off the old unit!). We also have all the required equipment to digitally record your vinyl records onto a soft format, including post processing and mastering where required to remove ticks and some scratches, if required! DJ mixes and are supplied in accordance with PRS licensing requirements. Supply of music to fitness instructors is subject to See prsformusic.com/licences/dj-mixes for further information. Have an idea for a new tune or a remix, or if there is a song you love but can't stand a specific part or want to remix the song, let us know! We'll mix, match and mash up the idea or song for you! For example if you need a break to take longer or a longer intro, we can loop sections or even speed up or slow down the tempo of the music to meet a particular routine without impacting the pitch (key) of the music. 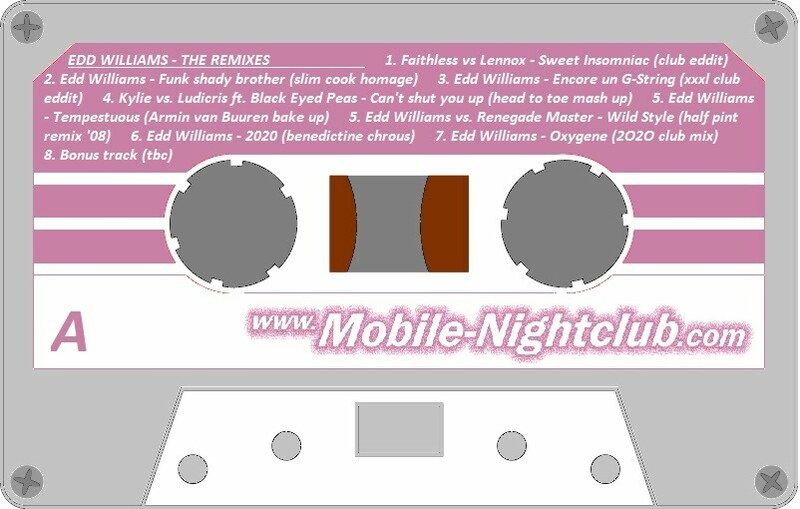 To discuss further, call or email on (07880) 558504 / edd@mobile-nightclub.com!